With all the changes in the last six months of switching job and learning a bunch of new stuff I have not been able to attend as many events as I have in the past. Especially being based in Bournemouth now rather than London. 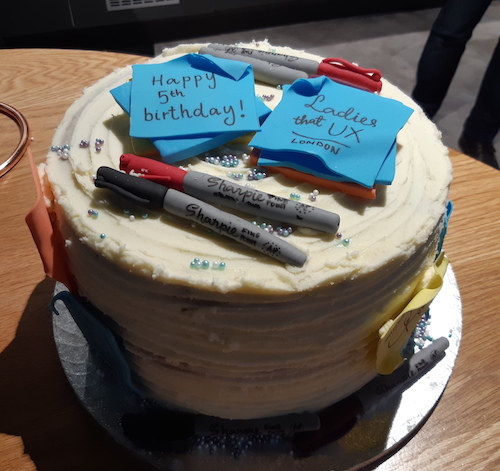 So it was great to be able to attend this months Ladies that UX London (LTUX) meeting, celebrating their 5th birthday. I have not been attending for quite that long, but I remember my first LTUX and how friendly everyone was and how inspiring the event was, the first leadership event I think. I remember my second too, which was a career event. The encouragement I received was immense and really inspired me to follow the UX path helping me to end up where I am now, in a job that I really enjoy with a great team; who knows what might happen in the future. This months event took the form of a panel, with Sophie Freiermuth opening the event and Florence hosting, while the panel consisted of LTUX founder Lizzie Kelly-Dyson, Sandra Gonzalez, Jason Mesut, Julie Kennedy. Everyone on the panel understood what it is like to run an event as between them they run a mixture of monthly and annual events. They started by looking back over the last five years at what has changed, or not, in UX. The biggest change they thought was how UX roles have become more narrow, so instead of doing everything we are now focusing more on different parts of the process. However there are still misconceptions about what UX is and while companyies might now know that they should have a team once they have them they do not always know what to do with them. There was also surprise at just how much impact events can have, especially if you are a design team of one. Events like LTUX give people the chance to learn new things that they might not learn at work and speak to others going through the same sort of journey. But I think the biggest reminder for me was around communication and how it is up to us to amend the way we communicate with our stakeholders and team members to make sure they understand what we are doing and why. Someone with a data background will need different information to someone in Marketing. The last piece of advice was ‘believe in yourself’, something that is so important, especially for the LTUX community. But it is so true and this community really helps to give us confidence to do that and to go far. It was a great event and lovely to catch up with everyone and there was an amazing birthday cake! I hope it is not too long before I can go back.